Mathematical Methods is an introductory course on mathematical methods for students aiming for a first degree in engineering or science. Topics covered include differentiation and integration and their applications; the geometry of two dimensions, and complex numbers. Statistics and probability are also discussed. 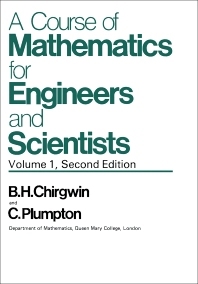 Comprised of eight chapters, this volume begins with an introduction to fundamental concepts, including the roots of equations; elementary two-dimensional coordinate geometry; limits and continuity; inequalities and quadratic forms; mathematical induction; and convergence. The discussion then turns to the techniques of differentiation and integration and their applications; the geometry of two dimensions; and complex numbers and their roots, together with trigonometric expansions. The book concludes with a chapter on statistics and probability, paying particular attention to the properties of a frequency distribution; some special probability distributions; normal distribution and the error function; and some probability problems. This monograph is intended for students taking a course in engineering or science.